We will always feel proud of our children mostly because we feel that our children’s success is our success as well. Parenting is never made easy, and sometimes we can’t help but lose our patience with our children. Of course, as parents, we need to remind ourselves to keep our cool to avoid hurting our children in any way. But as parents, we also should not feel stressed with them because we have too many things that are waiting to be accomplished. With that established, we have to have a helping hand that will not only help us manage all of our work, but most importantly, help our children step up their potentials. One Step Up Early Child Care LLC has goals on meeting your expectations as parents of your children. Giving you our best possible service and meeting your satisfaction, if not gratification, is an aim we want to achieve. Through your satisfaction, it pleases us as child care professionals seeing that our services are really helping children step up to their highest possible potential. Children have different ways of learning. Rather than being spoon fed, it’s always fun to enjoy exploring around and discovering certain things. Facilitation is of course important in the process of learning through exploration. To help step up your children’s potential in the academic field and in other fields, it’s best to teach them young in a way that they will understand. Stories, songs, rhymes, riddles, poems, shapes, colors, and all of those things facilitate the children’s early learning in arithmetic, language, and literacy. We don’t want to give our children food they can’t chew so we always start with the basics and teach them in ways children understand. This also helps children to love learning that serves as a foundation for their future education. We can’t just leave our children alone of course. Proper guidance should always be foreseen. The presence of safety precautions should always be exercised, and trained staff should be ready in case of any emergencies. Trained staff should also be the ones facilitating activities enriching your children’s potentials. The people you choose will matter. One service is different from the other. 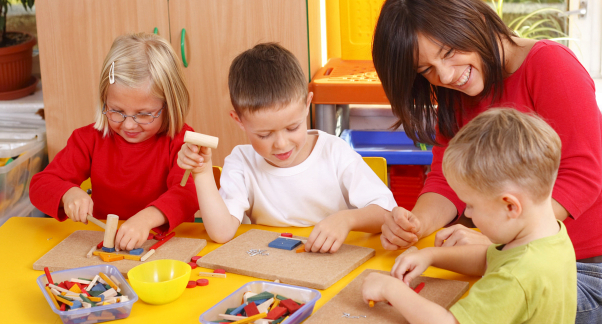 Our service specializes on children and their learning starting from the children’s infant stage to kindergarten. To sustain their learning and make sure they continue learning, we also provide after school care and even summer programs fulfilling our services as a Daycare in Maryland. Being a Preschool in Lanham, MD, we want to help you as a parent to step up your children’s potentials making them ready for their future education. To know more, talk to us today by calling 301-459-8296.